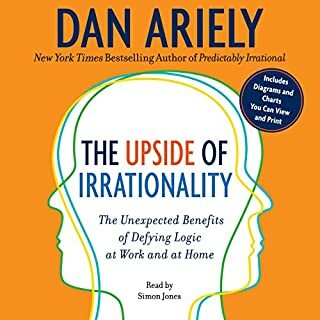 The point Ariely is trying to make is that the upside to being predictably irrational is that we can recognize and learn to modify our behaviors (to our benefit) if we can learn to question why we make the decisions, at the moment we have to, that we do. So yes, this book is very similar to his last. However, it illuminates how "knowing" that we are predictably irrational can help us recognize the moments at which these behaviors should be called into question. The result of which could be positively life changing. My only disappointment is that Dan Ariely is not a cognitive behavioral neuroscientist. His experiments seem only to add evidence to the arguments made by Geoff Colvin (Talent is Overrated), Daniel Coyle (The Talent Code), and Winifred Gallagher (Rapt). Aierly implies that our answers to the questions that arise out of life are a result of learned thought processes (reinforced neural pathways) and not necessarily the process of momentarily perfect rational thought. Dan seems to experimentally demonstrate that "reasoning" is not necessarily an accurate occupation of the brain, yet a result of the combination of previously hardwired pathways that dictate our individual answers. His point, we must overcome this glitch in order to more accurately asses the "real" in our own reality.